Combined 5 color pad printer(WE-9167-AS) - Guger Industries Co., Ltd. Application" 6"-9" inflatable ball, the printing area of steel plate is Ø110mm for avoiding the pollution on the ball. 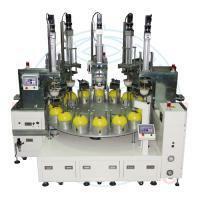 Manual feeding, auto multi-color printing, manual feeding. No graze on the ball. For strengthen machine body and large printing area, we use metal plate for machine combination. The pad's upward / downward movement is driven by Servo. And the height is controlled by POD for saving the labor and time. Steel plate moves forward/backward. The design can reduce the pad's shake. Japan large servo motor is used for the printing registration transmission. Good precision, long-term operation without displacement. Using Germany Ink cup for save the cost of ink & solvent, no scent, no smell, beauty printing color, low pollution and increase the production capacity.